Adult apterae of Thelaxes suberi vary in colour from pale green to dark brown (see first picture below). The terminal process of the sixth antennal segment is 0.26-0.40 times as long as the base of that segment. 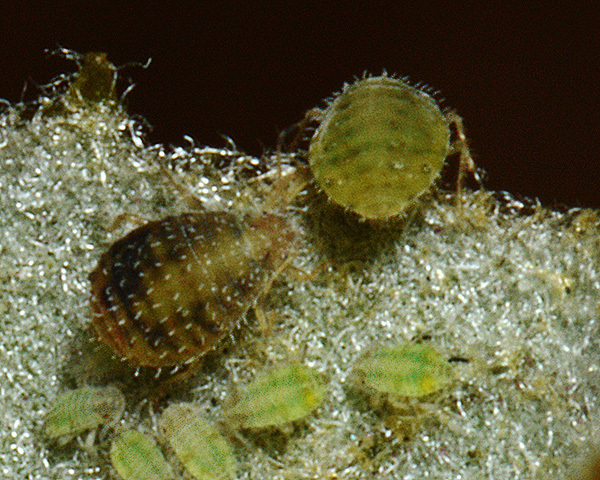 The hairs on the abdominal tergites are long and conspicuous; those on tergite 5 are mostly more than 25µm long, and very thick and dagger-like (cf Thelaxes dryophila which only has short dorsal hairs and those on tergite 5 are spine-like). Thelaxes suberi siphunculi are very short and the knob of the cauda is at least as long as broad. 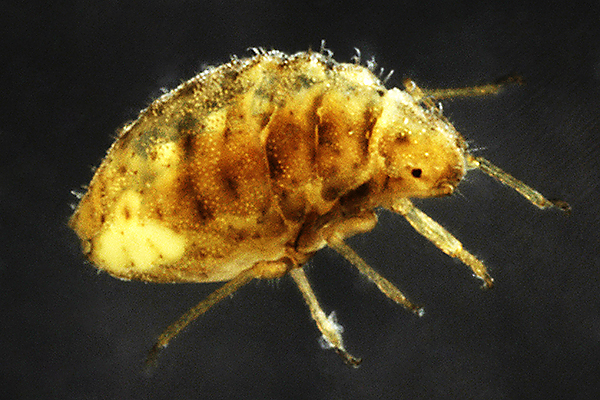 The body length of Thelaxes suberi adult apterae is 0.9-1.5 mm. 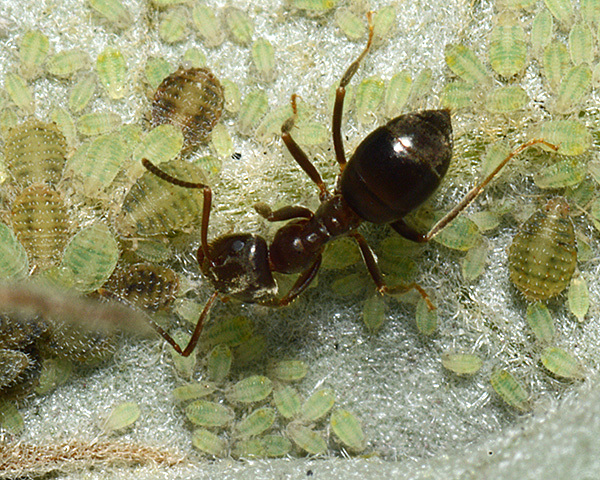 The Thelaxes suberi alate (see second picture above) has a black head and thorax with the antennae, legs and areas around the siphunculi dusky. The abdomen has conspicuous dark marginal plates. The wings of Thelaxes suberi are folded horizontally, rather than tent-like, over the abdomen. Immatures are greenish-yellow sometimes with pinky-brown patches. 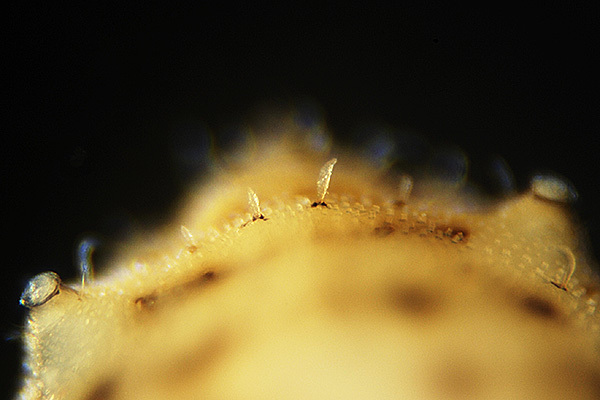 The micrographs below show (first) a dorso-lateral view of a Thelaxes suberi aptera, and (second) a close-up of the dagger-like hairs between the siphunculi. We have only found this species in one location, on holm oak growing in a churchyard on the South Coast of England. Mifsud et al. (2009) reported that Thelaxes suberi was frequent on Quercus ilex in the Maltese Islands, and often occurred concurrently with Hoplocallis picta and Myzocallis schreiberi. We have also found both these latter species on holm oak in southern England, although not with Thelaxes suberi. 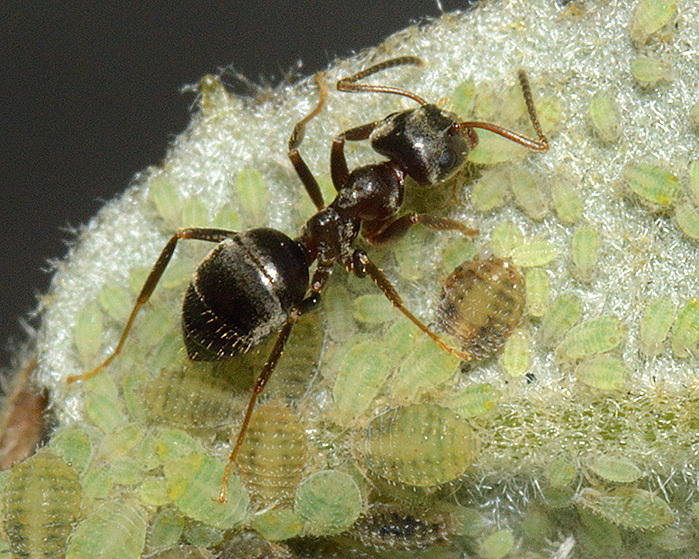 Much like the related Thelaxes dryophila, Thelaxes suberi is often attended by ants. 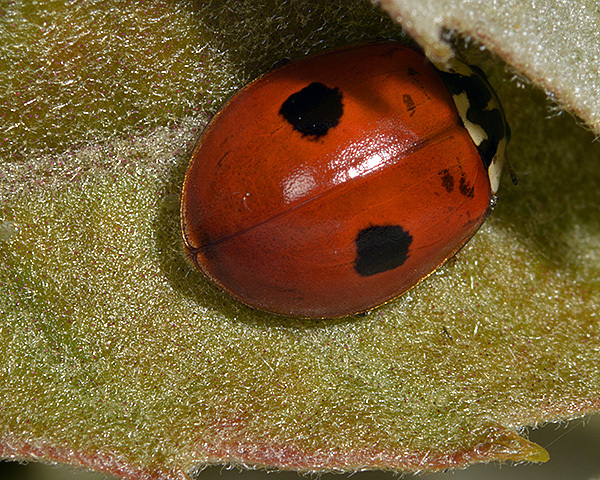 The only predator we have found so far attacking Thelaxes suberi colonies is the two-spot ladybird (Adalia bipunctata). Thelaxes suberi has been recorded from 20 Quercus species. 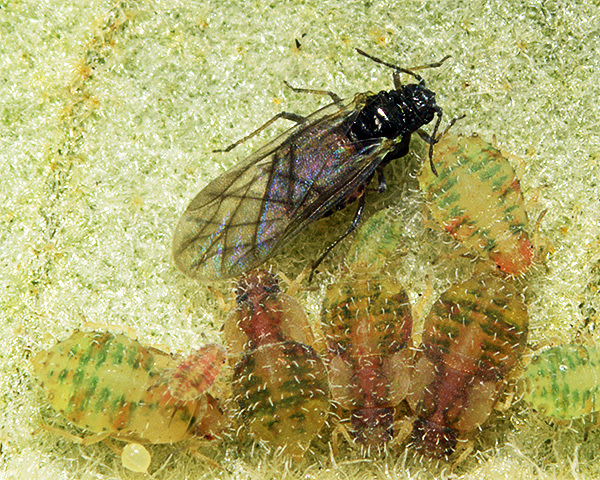 Blackman & Eastop list 21 species of aphid as feeding on European turkey oak (Quercus cerris) worldwide, and provide formal identification keys. 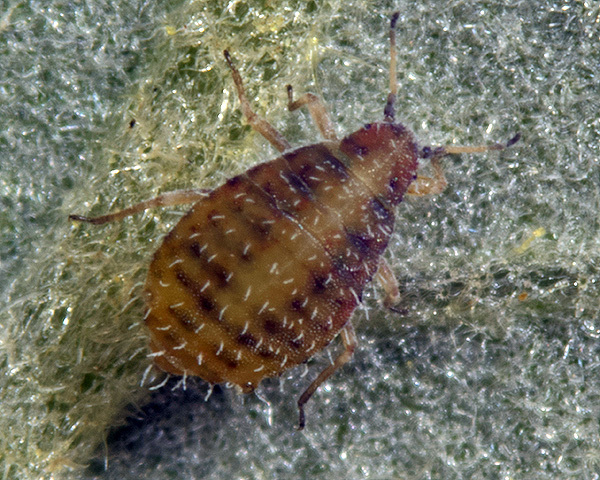 Of those aphid species, Baker (2015) lists 10 as occurring in Britain: Hoplocallis picta, Lachnus roboris, Myzocallis boerneri, Myzocallis castanicola, Stomaphis quercus, Thelaxes dryophila, Thelaxes suberi, Tuberculatus annulatus, Tuberculatus borealis and Tuberculatus querceus. 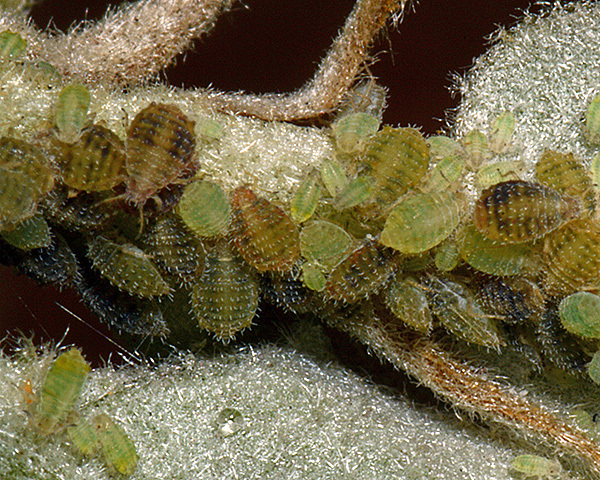 Blackman & Eastop list 25 species of aphid as feeding on evergreen oak (holly oak or holm oak, Quercus ilex) worldwide, and provide formal identification keys. Of those aphid species, Baker (2015) lists 10 as occurring in Britain: Hoplocallis picta, Lachnus pallipes, Lachnus roboris, Myzocallis boerneri, Myzocallis castanicola, Myzocallis schreiberi, Stomaphis quercus, Thelaxes dryophila, Thelaxes suberi, and Tuberculatus annulatus. Species of Thelaxes have been reported to cause economic damage to ornamental oaks (Alford, 2012). Alford, D.V. (2012). Pests of ornamental trees, shrubs and flowers: a colour handbook. Second Edition. Academic Press.